Many emerging nations, particularly those least developed, lack basic critical infrastructural services—affordable energy, clean drinking water, dependable sanitation, and effective public transportation, along with reliable food systems. Many of these countries cannot afford the complex and resource-intensive systems based on Western, single-sector, industrialized models. 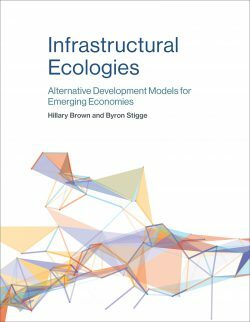 In this book, Hillary Brown and Byron Stigge propose an alternate model for planning and designing infrastructural services in the emerging market context. This new model is holistic and integrated, resilient and sustainable, economical and equitable, creating an infrastructural ecology that is more analogous to the functioning of natural ecosystems. Brown and Stigge identify five strategic infrastructure objectives and illustrate each with examples of successful projects from across the developing world. Each chapter also highlights exemplary preindustrial systems, demonstrating the long history of resilient, sustainable infrastructure. The case studies describe the use of single solutions to solve multiple problems, creating hybridized and reciprocal systems; “soft path” models for water management, including water reuse and nutrient recovery; post carbon infrastructures for power, heat, and transportation such as rural microhydro and solar-powered rickshaws; climate adaptation systems, including a multi-purpose tunnel and a “floating city”; and the need for community-based, equitable, and culturally appropriate projects.